Traveling is always associated with the pleasure of discovering new places as well as the excitement of scanning cities, especially when it includes visiting famous landmarks in the country that you are visiting. Landmarks include natural sites, beautiful landscapes, historical buildings and monuments, in addition to statues and sculptures. And who will be your best friend when you start your visit? Your camera will. 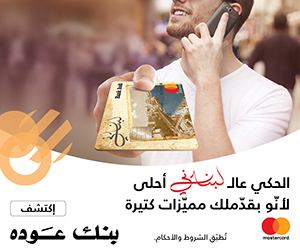 The camera will be your best companion to record all the memories and the beautiful moments that you experience, especially when you stand beside the most famous statues and sculptures that portray people who have played a big role in shaping history, that portray art, or that express a universal message. 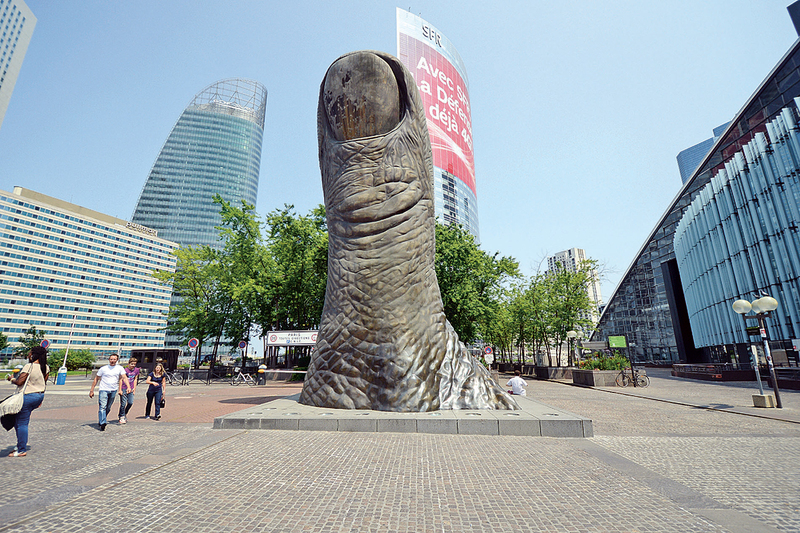 Le Pouce or The Thumb. Standing over 40 feet tall and weighing more than 18 tons, Le Pouce, or The Thumb was built in 1965 by sculptor César Baldaccini. You and your camera will react the same way when you face the magnificent posture of the Statue of Liberty in New York or the Christ the Redeemer statue in Rio de Janeiro, Brazil. When you pass across the Statue of Liberty to visit the City of New York, you will be astonished by the many statues and sculptures that the city offers to its visitors. Over 300 sculptures are found on the streets and in parks across the New York metropolitan area. 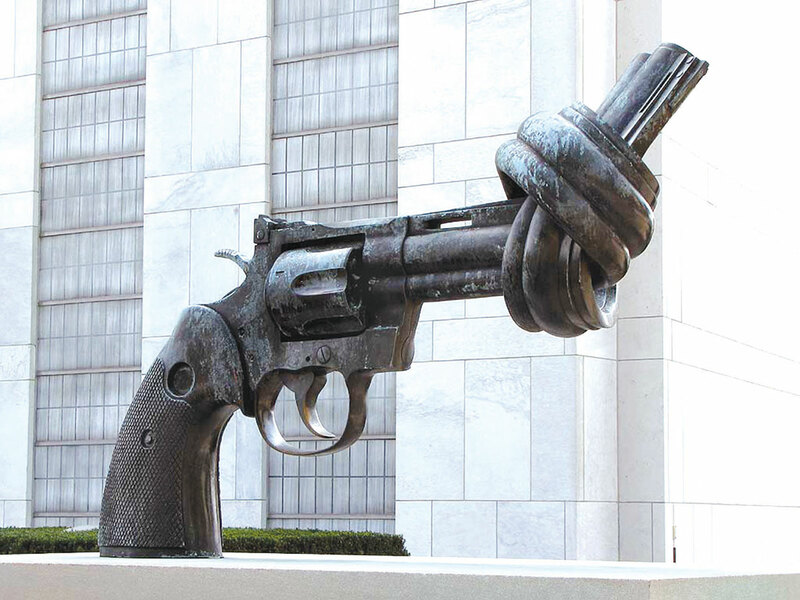 One of them is Non-Violence or The Knotted Gun, a world famous sculpture created by Swedish artist Carl Fredrik Reuterswärd in the 1980s after the shooting of famous Beatles member John Lennon. Since then, the sculpture has become one of the most recognizable symbols of peace. If you plan to visit the state of North Carolina in the USA, you have to stop at the Metalmorphosis, the incredible 25-foot stainless steel sculpture by David Cerny, a Czech-born artist. It can be viewed at the American Asset Corporation’s Whitehall Corporate Center in Charlotte. 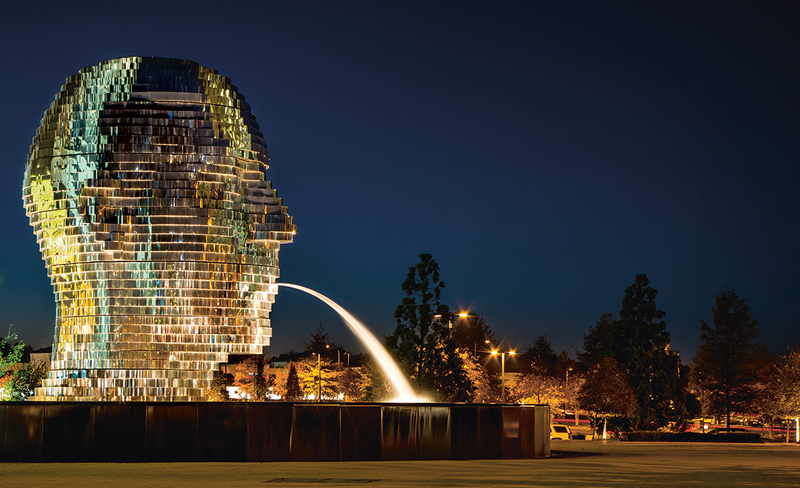 The 14-ton sculpture is made from massive stainless steel layers that rotate 360 degrees and occasionally align to create a massive head. 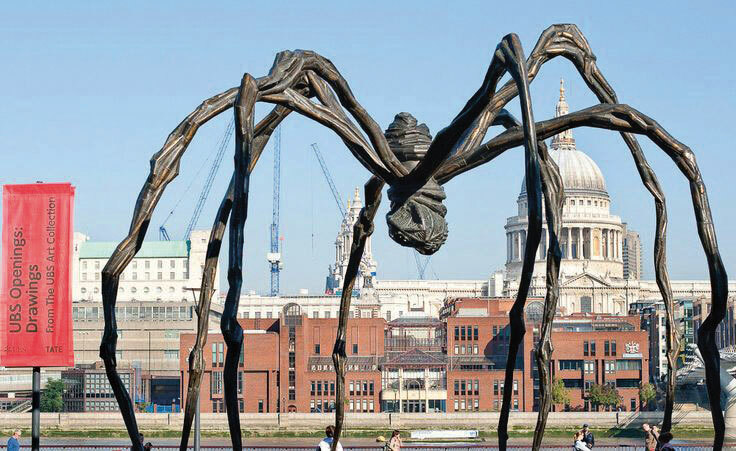 In London, at Tate Modern, you will wish to have your picture taken in front of the Spider, a giant, bizarre sculpture of an arachnid that stands nine meters high, created by the French-born American artist Louise Bourgeois, who worked for nearly seven decades to finish this masterpiece. 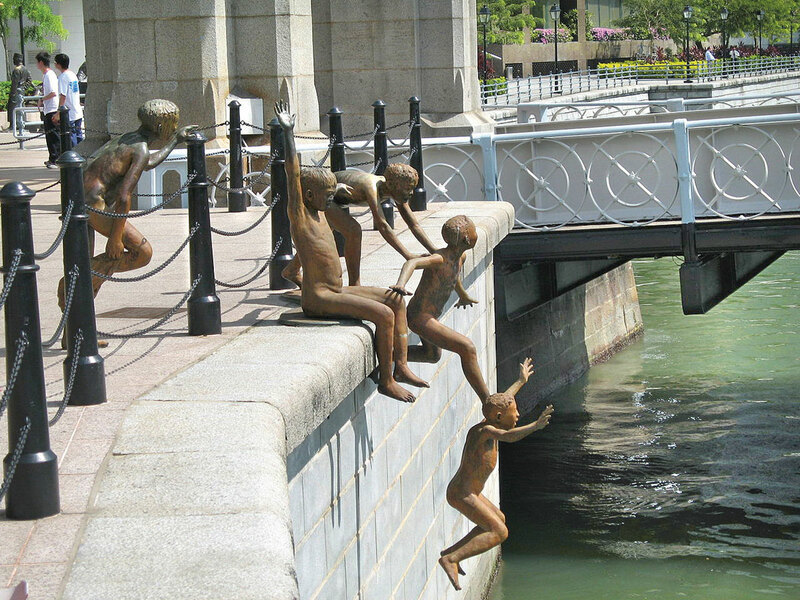 The sculpture is made of bronze and granite and was first displayed in 1994. 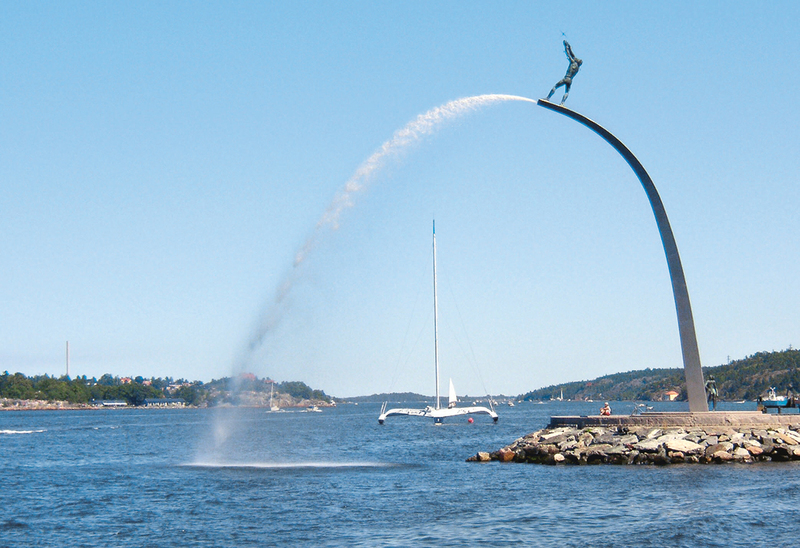 In Stockholm, Sweden, you can see the God Father on the Arch of Heaven, designed by Carl Milles. Milles (1875 – 1955) was a renowned Swedish sculptor best known for his fountain sculptures. 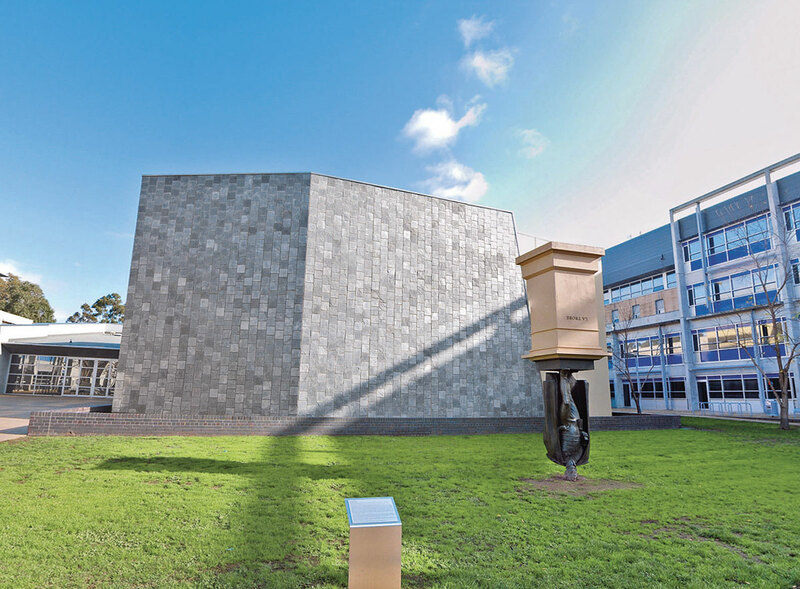 Finished by Milles’s students in 1995, this monumental sculpture stands 18 meters high. It shows a naked God balancing at the end of an arch, hanging stars in the sky, tossed his way by an angel at the base of the sculpture. 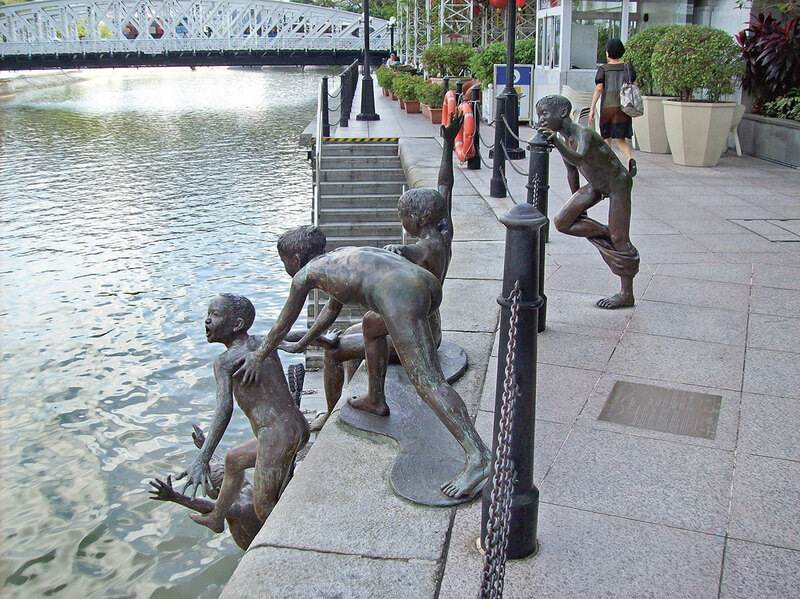 In the city of Singapore, along the Singapore River, you will certainly want to see the People of the River sculptures by local artist Chong Fah Cheong, each of which offers a freeze-frame of how life was in the past. While in Switzerland, a picture of you in front of the Giant Tap will amaze all your friends. Located in the Techno Park, Winterthur, the Giant Tap appears to float in the sky with an endless supply of water. 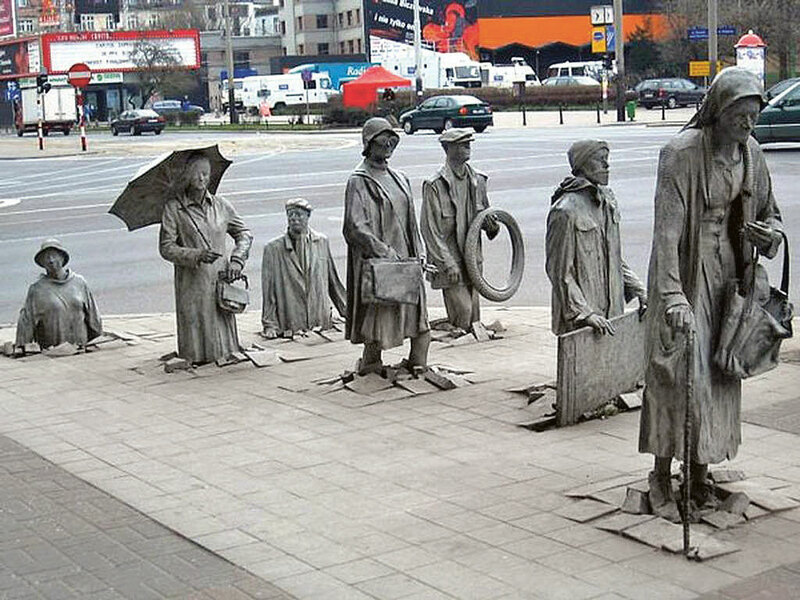 The Monument of an Anonymous Passerby in Wroclaw, Poland is another famous and eye-catching statue that signifies all of the souls lost, imprisoned, or otherwise harmed by oppression. The monument is located in the busy section of Wroclaw. While in the capital of Slovakia, Bratislava, the Man at Work, known locally as Cumil, meaning “watcher,” is a quirky sculpture created by local painter Viktor Hulik in 1997 after he was commissioned by a local magistrate to create some modern sculptures that would add some life to the reconstruction of the old city. In Melbourne, Australia, the Charles La Trobe Statue is phenomenal. Sculptor Charles Robb has turned the statue on its head, saying it embodies the notion that universities should turn ideas on their heads. Actually, the statue commemorates Lieutenant Governor Charles Joseph La Trobe who held office from 1839 to 1854, helping to establish the Royal Botanic Gardens, State Library, Museum of Victoria, National Gallery of Victoria, and the University of Melbourne. 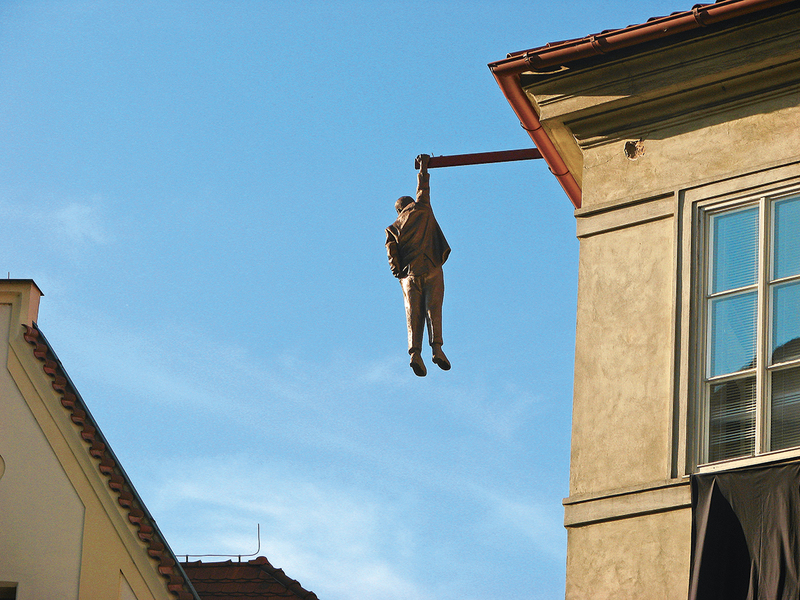 When in Prague, Czech Republic, you cannot miss the extraordinary Man Hanging Out sculpture. Created by Czech sculptor David Cerny, the Man Hanging Out humorously depicts Sigmund Freud dangling by one hand high above a city street. The sculpture is in Cerny’s signature provocative style and is among the works that have led him to be regarded by many as one of the best sculpture artists working in the world today. We have just had a small tour around the world to discover some of the most famous sculptures and statues. There are thousands of art works in the hundreds of cities around the world that deserve to be visited and appreciated.